Gymnova "Acroflex" akrobatiamatto. Joustavuus säädettävissä. Sprung floor sections with built-in adjustment mechanism, 4 cm deep foam, covering carpet and side skirts. Width = 2 m. Overall depth = 23 cm. Supplied in 1.50 m lengths. The two types of track, adjustable and non-adjustable (see GY-6270), may be used in combination. For example, an 18 m track with a 6 m adjustable section and a 12 m non-adjustable section. For special junctions between tumbling tracks and pits, please contact us. This track can be adjusted to suit all gymnasts’ builds and all ability levels. Due to its design, it contributes to reducing strain injuries due to fatigue during repetitive exercises. 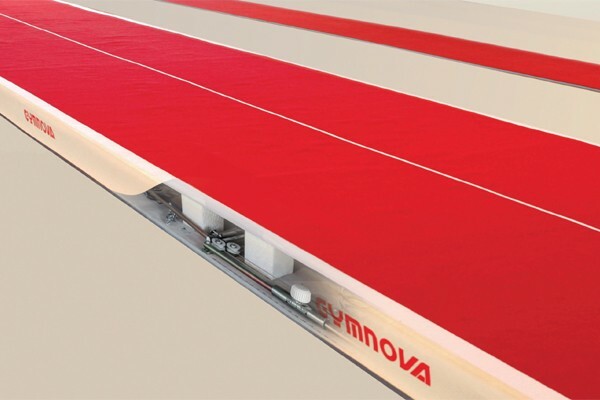 Each panel features quick and easy individual adjustment for elasticity, which enables rebound to be modulated over the full 6 m track length. - Length = 6 m.
- Width = 2 m.
- Overall thickness = 23 cm. - With junction between track and landing pit.